MasterSuite is made from industrial-grade engineered wood with a highly durable melamine finish and solid-wood drawers. It offers a wide range of configurations of shelves, cabinets, drawers, and hang rods. Trends in contemporary home décor, combined with an increase in urban living and multigenerational households, have been a boon to the storage industry. According to market research by The Freedonia Group, sales of home organization products in the U.S. will rise 3.8 percent annually through 2021 to $11.8 billion. 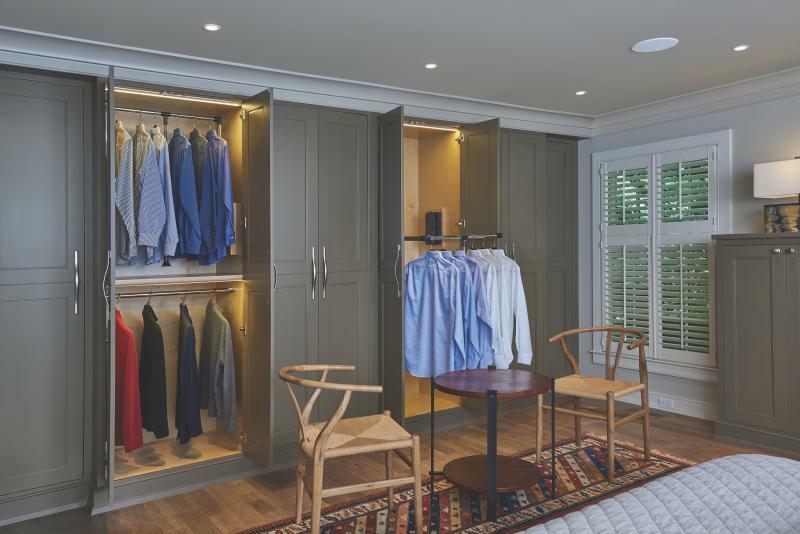 Although homeowners still choose wire-and-rod systems, there’s a growing desire for higher-end solutions in closet organization, from customized dressing rooms to room-integrated panels. In addition, there are myriad accessories that go beyond bins and baskets. The company offers closets that often rival kitchens, with stone-topped islands, cabinetry in on-trend color palettes, various hardware options, and lighting–from chandeliers to LED puck lights to strip lights in drawers and on rods. Many clients want dressing rooms, says Mindy Mitchell, certified aging-in-place specialist for design/build firm Sun Design Remodeling Specialists, based in Northern Virginia. “In our busy area, couples who have different work schedules want a system that enables one person to continue sleeping while the other gets ready for work,” Mitchell says. Manufacturers are responding with furniture-grade cabinets of varying sizes and stone-topped islands with storage. “As a standard, we use soft-closing slides on closet drawers,” Stevenson says. Whether it’s for a room-sized closet or a smaller configuration, lighting is key. “Strip lighting and LED puck lights are becoming more popular,” says David Townsend , senior designer at EcoNize Closets, in Falls Church, Va. And, in addition to overhead lighting, designers are specifying more under-cabinet, drawer interior, and rod lighting as well. A closet is only as good as its accessibility. The manufacturer’s Closet Pull-Down Rod is adjustable in length and pulls down to meet universal design needs and accessible applications. 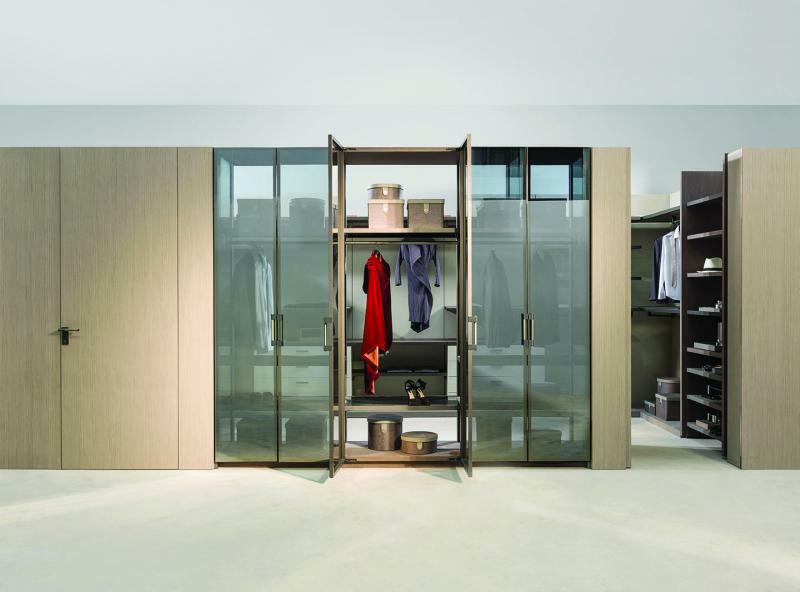 Closets no longer need to reside behind closed doors. They may be a pass-through from bedroom to bathroom or from the laundry, or an open walk-in in a master bedroom. “This makes it easy to find things and put them away,” Mitchell says. In some homes, closets are integrated into the walls as part of the room. The new-to-the-U.S. Brazilian brand Ornare “integrates the door and the panels so everything flows—a home theater with a closet, a home office with a bed, a dressing room near a bathroom,” says Pitter Schattan, director at Ornare. 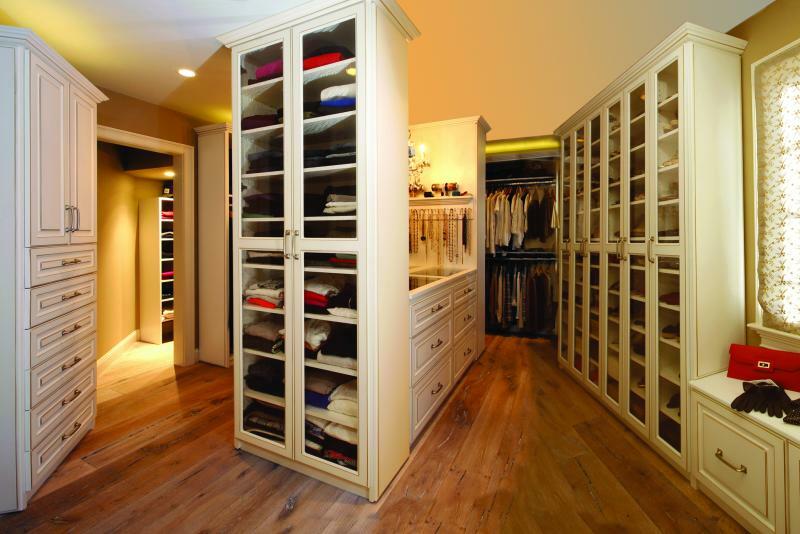 Homeowners also want their closets to match their décor. With gray continuing to be a popular paint color, many homeowners are opting for gray palettes in the closet as well. “Three out of the five colors in the ClosetMaid products we sell are in the gray category,” says Gregg Blevins, president of Residential Building Specialties, in Winston-Salem, N.C., a single-source supplier for closet design. Product materials are also upgraded to match furniture and other home cabinetry, with textured wood-grain, solid wood, melamine, high-gloss painted fronts, dovetail drawers, and beveled-edge shelves. “It’s almost become, ‘My kitchen has it; I want that in my closet, too,’” Townsend says. He’s also seeing interest in whitewashed wood, driftwood, and more distressed wood finishes. Designed for functionality in any room, the frameless Aspire program offers all of Wellborn’s door styles and colors, to allow for personalization. Accessories include shoe and pant racks, tie dividers, belt holders, jewelry organization, and charging systems. Wellborn Cabinet, known for its kitchen and bath offerings, also has a full closet program. Angela O’Neill, director of marketing and advertising, notes a trend in contemporary and transitional looks and lots of white. People also want texture in their cabinets, and Wellborn offers products in embossed melamine and decorative laminate veneer. It’s the details that make these systems work for homeowners. “What’s important is having the proper accessories to make every item easily accessible and store well,” says Ellen Wise, design coordinator at Harth Builders, in Spring House, Pa.
Wellborn, says O’Neill, has a strong list of products that support the functionality of the room, whether it’s a pantry, a closet, a home office, or a bedroom—everything from drawer dividers, jewelry organizers, hooks for handbags, and power outlets for plug-in devices. 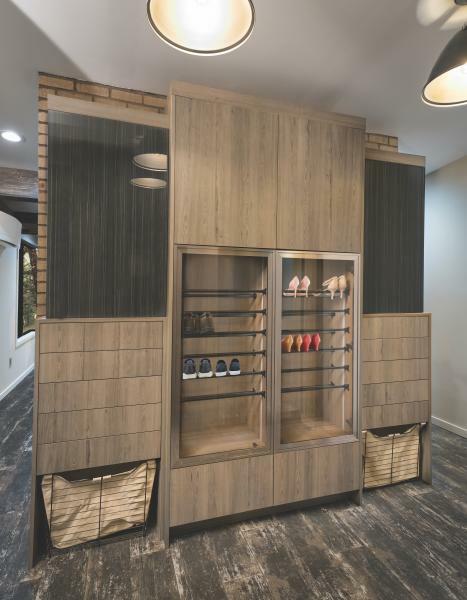 This custom closet pass-through features hanging space, glass-front doors, shoe storage, a dressing table, and lighting. Made of thermally fused melamine, the doors, drawer fronts, and crown molding have a “glaze” finish. Rev-A-Shelf supplies the closet industry with products designed for accessibility, such as pull-down closet rods, pullout shelves and drawers, and a new glide-out hanging device that debuted at the 2018 International Woodworking Fair. Crystal Case is a closet system that looks like a shop window, the company says, featuring transparent glass, aluminum profiles, and invisible hinges. Other details include built-in lighting on the shelves. The line can be used for storage in any room.